As I have written before, for example here, when it comes to politics there are two diametrically opposite ways of looking at the world. One way is the progressive orthodoxy, pervasive here in Manhattan, and the other way is my way, probably best called libertarian. The difference has been on full display in the recent debate over gun control in the aftermath of the shootings in Sandy Hook, Connecticut. Both philosophies start from the premise that human society is filled with flawed behavior and unfair results. In the progressive view, there is a simple solution to every such human problem: the government can fix it with new laws ordering people to behave properly, or alternatively through the power to spend money. The libertarian view sees major problems with these seemingly simple solutions, including that many people do not obey rules, that government actors are themselves flawed and often corrupt, that people engage in evasive strategies, that there are endless unintended consequences, and that the effort to make things perfect through more rules actually makes things worse because of loss of freedom. [T]here have been an endless series of deadly shootings across the country. . . . We can't tolerate this anymore. These tragedies must end. And to end them, we must change. We will be told that the causes of such violence are complex, and that is true. . . . . But that can't be an excuse for inaction. Surely, we can do better than this. If there is even one step we can take to save another child, or another parent, or another town . . . then surely we have an obligation to try. President Obama rightly sent his heartfelt condolences to the families in Newtown. But the country needs him to send a bill to Congress to fix this problem. Calling for ‘meaningful action’ is not enough. We need immediate action. We have heard all the rhetoric before. What we have not seen is leadership – not from the White House and not from Congress. That must end today. That captures the progressive view perfectly. You “send a bill to Congress” and that will “fix the problem.” No ifs, ands, or buts. Of course everyone will do what Congress orders them to do, and law enforcement will perform flawlessly. Police are awesome. I love working with cops. However any honest cop will tell you that when seconds count they are only minutes away. The average number of people shot in a mass shooting event when the shooter is stopped by law enforcement: 14. The average number of people shot in a mass shooting event when the shooter is stopped by civilians: 2.5. The reason is simple. The armed civilians are there when it started. . . . Gun Free Zones are hunting preserves for innocent people. . . .
1. Oregon. NOT a gun free zone. Shooter confronted by permit holder. Shooter commits suicide. Only a few casualties. 2. Texas. NOT a gun free zone. Shooter killed immediately by off duty cop. Only a few casualties. 3. Connecticut. GUN FREE ZONE. Shooter kills until the police arrive. Suicide. 26 dead. 4. China. GUN FREE COUNTRY. A guy with a KNIFE stabs 22 children. So what exactly is the legislation that will “fix the problem”? The proposals on the table, generally involving renewing the lapsed Federal restrictions on “assault weapons,” are completely meaningless in my view. They certainly would not have had any meaningful effect in the Connecticut event. Is there an alternative proposal? Ban gun ownership by civilians entirely and authorize the police to search everyone’s house and seize the weapons? Then we have a world where millions of law-abiding citizens have their guns taken and guns are owned only by the police and by the worst of violent criminals, who of course will pay no attention to the ban. Improvement? The most amazing aspect of this is that the leading spokespersons for the progressive position all have their own armed protection. 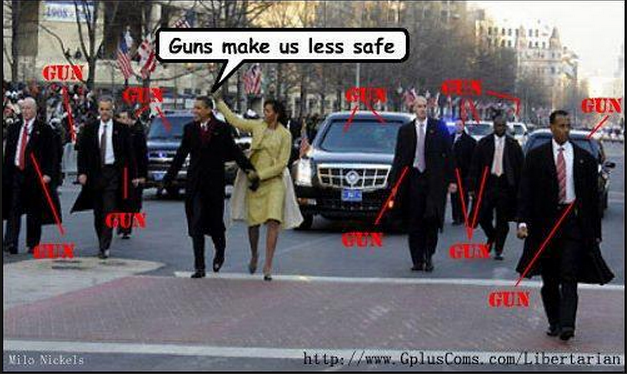 President Obama has the secret service. Mayor Bloomberg has 24-hour armed protection from the New York City police. Diane Feinstein, leading Senate proponent of new gun restrictions, is a gun permit holder. Love this picture from Instapundit. Is President Obama's life more important than mine, or yours?